Ursini makes a traditional red sauce using traditional methods and Italian tomatoes, pork cheek and extra virgin olive oil. 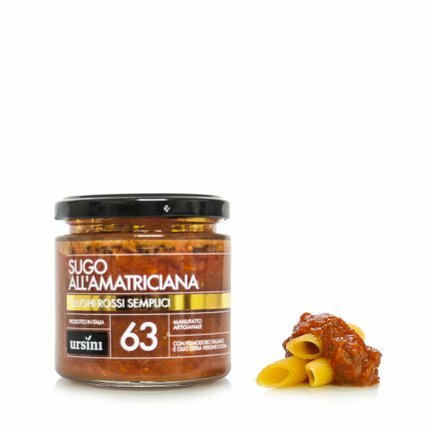 The amatriciana sauce is ideal together with long pasta such as spaghetti and bucatini. 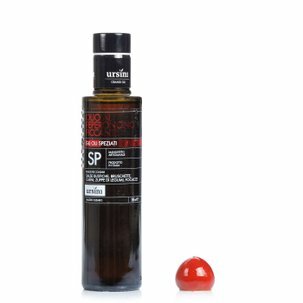 Ingredients tomato 81%, aged pork cheek (pork, salt, natural flavourings. Antioxidant: ascorbic acid. Preservatives: sodium nitrite and potassium nitrate) 9.7%, extra virgin olive oil 7.2%, onion, white wine (contains sulphites), black pepper. Allergens: Sulphites. P For more information on product labels, please contact our Customer Service department. The information on the labels of the products may vary for reasons beyond our control, therefore, there may be discrepancies between the information on the site and that on the products delivered. Please always check the information on the product before consumption or use. For the Ursini family, the fundamental rule is their attention to the ingredients. This is why they select healthy olives, ripened to the right point, harvested by hand and ground the same day. This is the only way to obtain a high quality oil with such an excellent flavour. 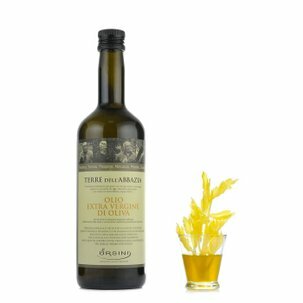 Furthermore, the company is set apart by its individual processing of the various olive varieties and for its offer of an sophisticated range of sauces and conserves. Continuous search for perfection at the service of the most attentive consumers.